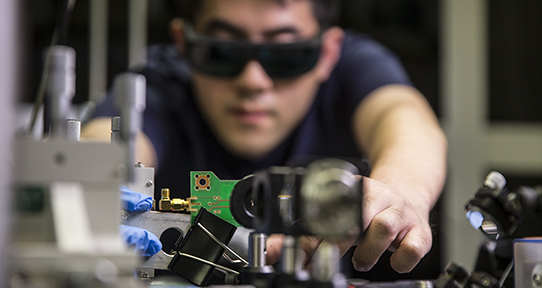 Graduate student Dao Xiang measures the electric response of metasurfaces through the natural oscillations of nanoparticles, an aspect of the research work he’s doing with ECE professor Reuven Gordon. Under the supervision of world-class faculty, our graduate students conduct cutting-edge research with state-of-the-art computing and laboratory facilities. You can also participate in co-operative education and work as a research or teaching assistant.